For the January/February issue, we asked local design professionals their opinions on light-colored wood cabinetry in the kitchen. Photography courtesty of William Ohs. “Classic. Light stains on wood always will be desirable because they allow the natural beauty of the wood to be showcased, especially on woods like knotty alder and cherry. The beauty nature produces always will be timeless.” Jennifer Lewis, Signature Kitchen & Bath. “Most families spend a majority of their time in the kitchen. Whether it’s entertaining, doing homework with the kids or working on their favorite recipes, it’s the favorite place to gather. The light-colored wood cabinets give an open yet warm feel to a room, creating the kitchen into an inviting place - not only for eating but socializing as well. I think the light-colored wood option is a classic in the kitchen.” Laureen Wilder, Laureen Wilder Designs, LLC. “Classic. Light wood has been around forever, and it is not going anywhere soon. 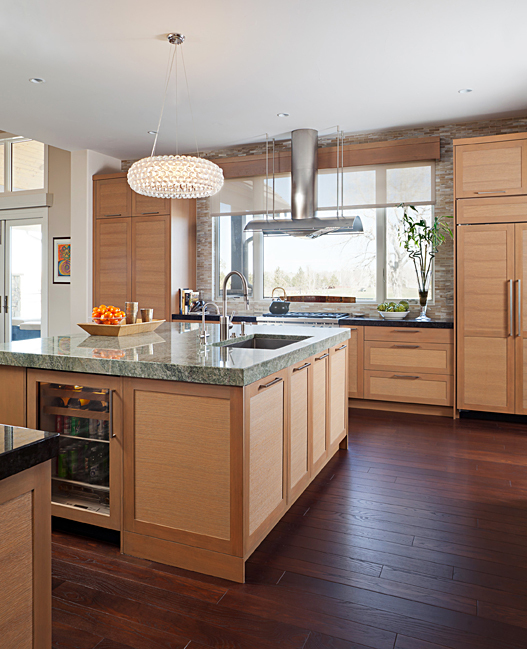 You see more contemporary-style kitchens than traditional.” Susan Block, The Designing Block. “Light is never out. And especially these days, there are so many ‘right’ choices. Builders gave us a lot of natural and amber-stained oak in the '80s and '90s. Light oak seems to be out simply because we are tired of it. Oak in espresso or washed gray finishes, on the flip side, look fresh and on trend. So if we do oak, it is anything other than the ubiquitous light-amber stained oak we’ve grown tired of. Other light finishes, like natural maple, are popular because they mix well and don’t fight stronger grains of oak or patterned floors. Light cabinets are desirable when creating a contrast to the currently popular darker floors. Light-stained cabinets always will look current when paired with contemporary tile, lighting and other accessories. Ideally, our cabinets should be timeless in style and good quality, regardless of color, and only our accessories and appliances need to change to make a space feel current.” Dana King, Next Project Studio. “Personally I think light-colored wood is a craze. The trend of light- or dark-colored woods seems to go back and forth every few years. White is about the only color that never seems to go out of style.” Ashleigh Schroeder, National Kitchen & Bath. “It is both a little classic, but more so a craze. The current light finishes, like most color trends, usually are a craze, but these may be somewhat timeless since there is little coloration in that it is often representing a washed-out, faded or weathered finish. In my opinion, the only true classics are white paints and wood stains that are found in historic settings.” Keith Gegg, Gegg Design & Cabinetry. “I, myself, love lighter-stained wood. I just have not seen it gaining in popularity yet. I have had only a handful of customers request it in the last 15 years. I remember it was more popular in the '90s.” Sue McCann Henry Kitchen & Bath.